The resort comprises a total of 95 two and three bedroom apartments. The double bedroom apartment has main bedroom with large bed and one twin bedroom and the three bedroom apartment has main bedroom with large bed and 2 twin bedrooms. 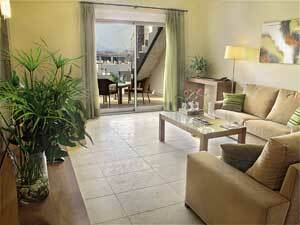 All the apartments have two bathrooms, living-room, kitchen fully equipped, laundry room and terrace. All the buildings have a garage and at the resort they have two outdoor pools, restaurant, lobby and a playground for children.